My Friend Pedro was at E3 and boy howdy was it a jolly ol' time! While staying quite about the game for a while I was busy preparing things for bringing the game to E3, showing the game to journalists and the world in the Devolver parking lot. I'm happy to report it all went really, really well, and I'm so grateful for having gotten this opportunity, and I'm so so grateful people really seem to enjoy the game! If you haven't already, check a look at the trailer above! And as if just the adventure of going to E3 wasn't enough, the game got nominated for "Best of E3" by PC Gamer and CGM! It also got nominated for "Best Action Game" by IGN! 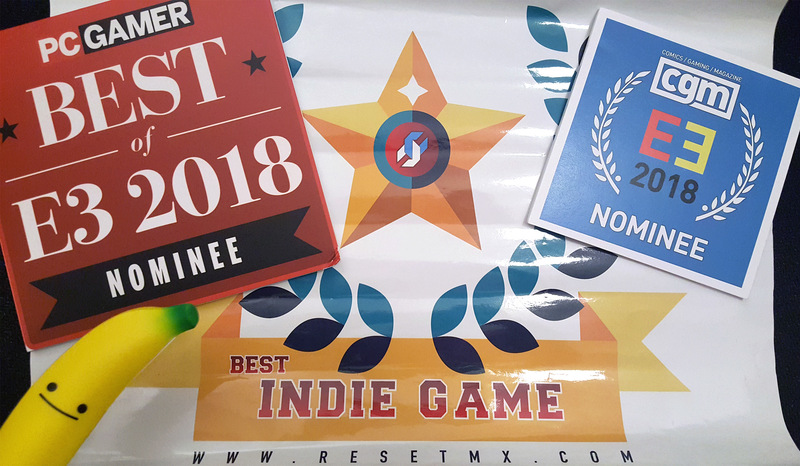 And it won "Best Indie Game" by Resetmx! Incredible. And don't forget all of these nominations happened next to big AAA titles. Feels really surreal. Thank you all for being part of the journey up to this point, and here's hoping you'll stick with the game until the actual release!